which gives her around 7knts cruising and barely uses any diesel. With regular use, approximate spend on fuel is around £100 per year, so very economical. for a day trip or weekend away. She’s currently out of the water with the intention of re-anti-fouling her and revarnishing the wooden rubbing strake. Some deck paintwork required. 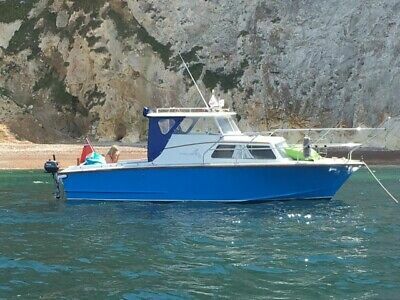 This Cleopatra 23 Motor/fishing Boat For Sale Lying On The South Coast, Hamble River boat is located in Southampton, SO31 9FR and is being sold on eBay by katelgmf.